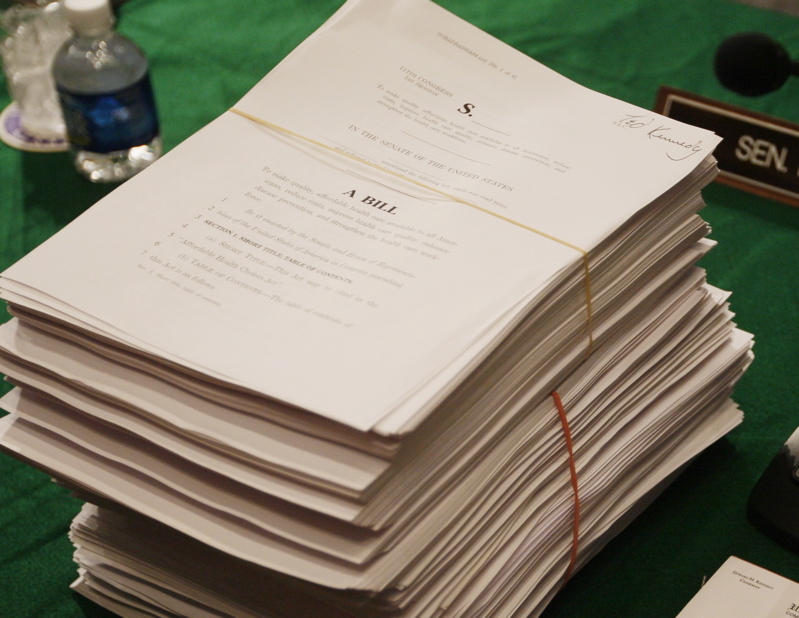 Several bills are proposed that would further block access to government data, inhibiting the public’s right to know. The public’s access to government information is under attack in Maine. Gov. 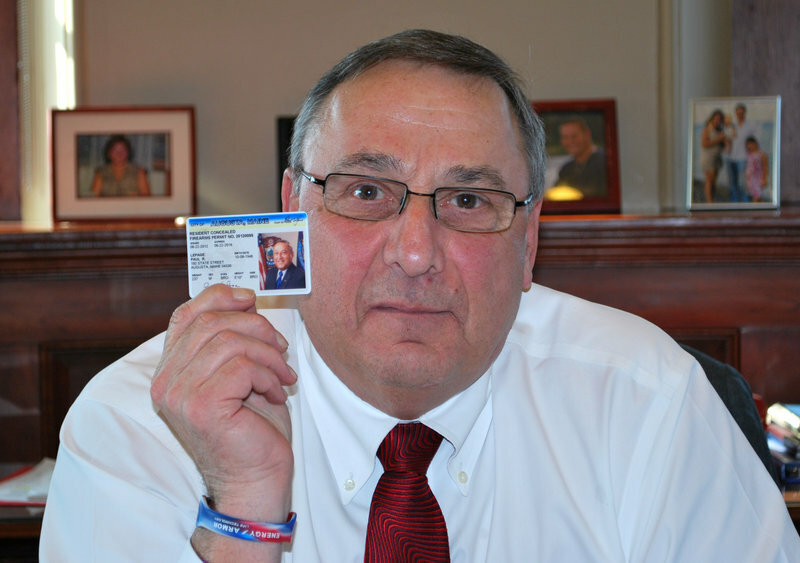 Paul LePage displays his concealed-carry permit in a photo posted to his Twitter account on Thursday, Feb. 14, 2013. Legislators will consider a bill to block access to personal information about people who hold concealed-weapons permits. Bills in the current legislative session that would seal off public access to government records include a measure sponsored by Democratic Rep. Mary Nelson of Falmouth. An outspoken critic of Falmouth government used the open-records law to obtain about 3,000 email addresses of subscribers to the town’s electronic newsletters. The critic used the addresses to distribute information during a campaign to end Metro bus service in Falmouth. Another legislator, Rep. David Burns, R-Whiting, is sponsoring a bill to shield 911 dispatch transcripts. The proposal was submitted after the Portland Press Herald filed a lawsuit in Cumberland County Superior Court asking a judge to overturn the state’s denial of the newspaper’s public-records request for 911 transcripts associated with an open homicide investigation in Biddeford. Privacy, public safety and the threat of identity theft are being cited to support a bill by Rep. Corey Wilson, R-Augusta, that would make concealed-weapons permit data confidential. The data has been public since 1981, when Maine’s concealed-weapons law was enacted. Wilson’s bill was filed after a New York newspaper, in the wake of the Newtown, Conn., school shootings, published lists and an online map of all handgun permit owners in two counties. Support for Wilson’s bill mushroomed when the Bangor Daily News filed a request for Maine concealed-weapons information last month. That request was later withdrawn, but it stirred such concern that the Legislature overwhelmingly passed an immediate, 60-day ban on releasing concealed-weapons information, until Wilson’s bill can be heard and debated. Laurenellen McCann, a national policy expert for the Sunlight Foundation, said many efforts at the state level to take information off the public record have a narrow focus. But she said these efforts to address isolated problems can have a cumulative impact on government transparency. That’s the concern among open-records advocates in Maine, who were dealt a blow when the Legislature passed the emergency measure to temporarily shield the concealed-weapons data. Concerns about Maine’s willingness to open government to public scrutiny are nothing new. Just over 10 years ago, the Maine Freedom of Information Coalition dispatched a team of volunteers across the state to request public records from towns and police departments. An audit report on the effort documented woeful compliance with the laws, including instances during which the volunteer auditors, some college students, were either denied or intimidated by police officers for requesting public documents. The audit, highly publicized on New Year’s Day in 2003, prompted action by the Legislature, which was “embarrassed,” according to Mal Leary, president of the coalition. State and local public officials now receive mandatory training to help comply with the law, and lawmakers established the Right to Know Advisory Committee, which reviews proposed changes to the law and offers recommendations to the Legislature’s Judiciary Committee. Still, states like Texas, Florida and Vermont have much stronger sunshine laws. In Florida, government transparency is written into the state constitution, which means that attempts to change or weaken the law require a supermajority of the Florida Legislature or a citizens initiative. Not so in Maine. Not only can the Legislature easily alter the open-records law, but it also appoints members to the Right to Know Advisory Committee. Although the panel is populated by open-records advocates, Schutz, the media attorney, said it has also included “complete failures” and “government types.” Schutz’s didn’t identify specific members, but noted that the panel is appointed by the governor, the Senate president and House speaker — politicians whose interests may not always align with open-government efforts. Transparency and open government are now buzzwords for politicians who recognize the populist value of lifting the veil on government business — at a time when opinion polls repeatedly document the contempt many citizens have for elected officials. LePage vowed to have the most transparent administration in state history when he ran for governor in 2010. He devoted an entire page of his campaign website to the policy endeavor. LePage has taken several steps to increase government transparency. He signed a law to close a disclosure loophole that allowed lawmakers and state officials to profit from state-paid contracts. He recently unveiled Open Checkbook, a site that allows the public to track government spending. And he funded the position of ombudsman in the Attorney General’s Office to mediate disputes over public records access between citizens and government. But it’s unclear what the ombudsman has accomplished since the position was filled in September. Leary, at the freedom of information coalition, said LePage has been an “enigma” on the public’s right to know. In 2011, LePage created a work group of business leaders and, through executive order, exempted the meetings from the public-access law. Last year, LePage claimed that political opponents and some news organizations were using the state’s FOAA law as a form of “internal terrorism,” inundating his administration with “nuisance” records requests, including one for the Blaine House grocery bill. The governor later said that such requests were behind his proposal to exempt his administration’s “working papers” from public-disclosure requirements, including correspondence related to potential legislation and policy matters. The proposal was soundly defeated. However, LePage later told Leary, who was the owner of the Capitol News Service at the time, during an interview that he’d instructed his staff to limit its use of email and written correspondence to avoid the Freedom of Access Act. Public officials frequently lament that they’re inundated with public-records requests, some of which can be used to embarrass them. Some contend the requests are too broad and time-consuming. The Sunlight Foundation’s McCann said government officials should worry less about the intent of public-records requests and more about finding ways to make the information readily available on the Internet. She noted that states such as Utah are considering proposals that would make it easier and cheaper to access public records information using technology. Other states have been more aggressive in moving toward transparency. In North Carolina, a lawmaker recently introduced a bill that would criminalize an illegal denial of public records, with a $200 fine and up to 10 days in jail. It’s unclear if the bill has much traction, but it’s a stark contrast to efforts in Maine where, as Schutz noted, there are few penalties or other disincentives for violating the open records law. It’s also expensive to challenge rejected requests. The prospects for improved transparency in Maine appear to be dim. Open-records advocates had hoped to focus their energy in the current legislative session on beefing up public access. Instead, at least in the case of the concealed-weapons bill, they’re struggling to keep records in the public domain that have been there for 32 years. Complicating the debate is the sense of emergency — real or not — and the highly polarized positions surrounding the issue of guns. Bunting, at the National Freedom of Information Coalition, said bad things happen when decisions that affect transparency are made in such a charged atmosphere. “As a rule, when an open-records law is amended in response to an uproar, it’s usually not good for the law,” he said.